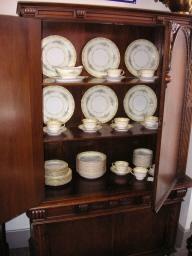 To browse our entire color photo gallery Antique Furniture Styles! 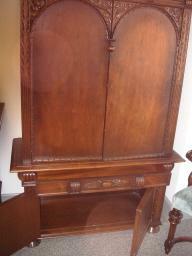 When we started in business over 12 years ago we were drawn to the furniture made between 1845 and 1915. This was such a dynamic time in the history of the United States. This era witnessed the westward expansion across the continent, rapid industrial growth, civil war, huge migrations of Irish, Italians, and Germans (including many skilled carvers and craftsmen that went to work in the furniture factories), the centennial celebration of 1876, the dawn of rapid mass transportation, and the rise of a very rich entrepreneurial class willing and able to spend lavishly on houses and their furnishings. The era ended with the First World War when suddenly America found out what had long been expected---it was indeed a major world power. All these trends and events influenced a thriving furniture business that was fiercely competitive, superb in quality, and uniquely American. Rococo Revival (1845-1865): Furniture of the Rococo Revival period was usually made of walnut, mahogany, or rosewood. 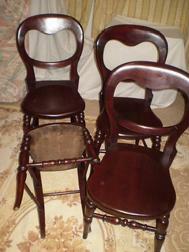 Parlor pieces seem to be the most available. Parlor tables, chairs, and sofas have cabriole legs and often feature naturalistic carvings of fruit, flowers, and leaves. The table tops are either turtle shaped, round, or oval. The foremost cabinetmaker of this period was John Henry Belter who used a technique of laminating the wood (primarily rosewood) to produce a curved yet durable surface. This process was copied by many of his contempories. Other pieces of Rococo Revival furniture will also tend to have the naturalistic carvings. The fronts of dressers are oftentimes serpentine shaped and the corners are rounded. Leaf or fruit carved pulls decorate the drawers. The Rococo Revival style is very popular today and is reproduced. It's not difficult, however, to spot the reproduction. The carvings are much flatter and less detailed than the originals and the copies are never made out of black walnut or rosewood. Renaissance Revival (1860-1880): The style was mostly produced out of walnut but mahogany, chestnut, and rosewood were also frequently used. Attributes of the Renaissance style are turned and fluted legs, raised or inset burled panels, heavily carved finials and crests, inset marble tops, and cookie cut corners. Many pieces are further decorated by black and gold incising, marquetry inlay, and bronze or brass mounts. John Jelliff of Newark, New Jersey was one of the more popular craftsmen of the Renaissance Revival furniture. His parlor sets featured carved heads on the arms and crest, with Sevres painted plaques sometimes in the crests. Many gargantuan pieces of this style were produced with some sideboards or beds exceeding 14' in height. The Renaissance Revival period reached its zenith at the Philadelphia Centennial of 1876 where many of the foremost furniture makers of the period exhibited their proudest accomplishments. Turn-of-the-century: As it's name would suggest this period of furniture was made between the Spanish American war and World War I. With the sudden scarcity of black walnut and chestnut wood, furniture makers turned to oak as their medium. By cutting it in a special way (called quartering) sawmills of this time produced lumber that had a rich "tiger" type grain. (Because of the difficulty of this cutting method, few lumber yards today produce quartered oak). Borrowing from the prevalent art nouveau style, the better furniture companies made lovely pieces with shaped drawers, curved beveled mirrors, curved legs oftentimes ending in a claw foot, profuse swirly carving, and fancy turned spindles and columns. Drawer pulls were commonly made of fancy cast brass on the better pieces or sometimes pressed sheet brass on the more ordinary ones. While most collectors prize the oak from this period, mahogany was also used and was in fact usually more expensive than the oak when it was originally sold.